Two years ago almost to the day, I took this photo, looking northwest from Descanso Bay Park on Gabriola Island. The low angle winter sun, combined with the sea and the furrowed sandstone so characteristic of Gabriola’s shores, formed a tapestry of light, shadows and subtle colours that I found visually irresistible. And now, here in the northern hemisphere we are once again at winter solstice: the day that holds the least light and the longest darkness of the entire year. At this season, most of us seek extra light, looking for the warm and welcome sense of comfort it can bring. Today the sun will stop moving southward. It will briefly pause (“solstice” comes from the Latin words for “sun stops”), then it will start moving northward again. Of course, it’s not really the sun that’s moving – it’s our earth, relative to the sun’s position. All the same, today is a welcome occasion. Before too many weeks, we’ll start to see the difference in the length of our daylight hours. As we celebrate the start of the light’s return, here’s wishing all readers a peaceful, happy and healthy holiday season. 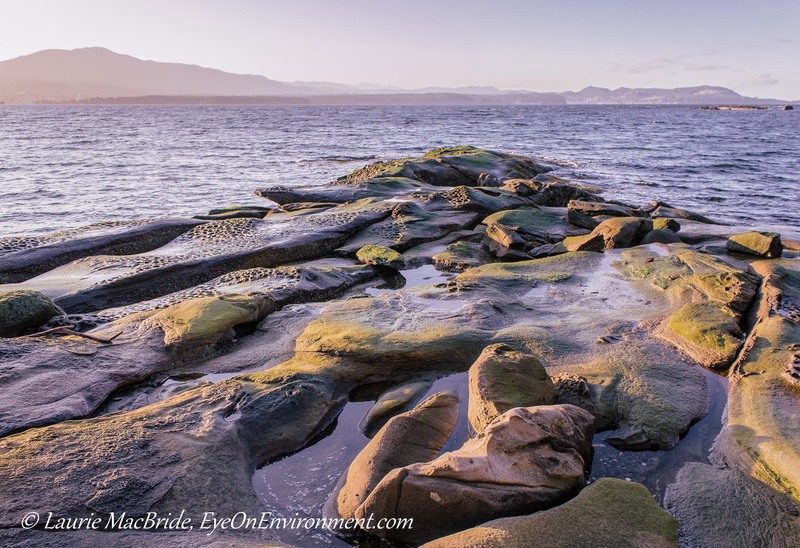 Posted by Laurie MacBride, Eye on Environment on December 21, 2013 in BC coast, Gulf Islands, Musings on Life and tagged beaches, Gabriola, light, nature, photos, shoreline, solstice, winter. Beautiful light and lovely shot! Thanks! This is one of my favorite spots on Gabriola and I love that low angle winter light on the sandstone. Merry Christmas and a Happy New Year. Love the colors on this photo. Thanks! And here’s wishing you all the best of the season too. I find this work of yours visually irresistible too. It is one of my favourites. I wish you and yours a joyous and meaningful holiday and all good things for 2014! Thanks, Sherry! I wish the same for you and your family, and I look forward to the visual treats that I know you’ll be bringing to the new year!